Moisturize your face with a natural product, the Green Tea Moisture Cream from Innisfree! This Korean skincare product is from the famous Green Tea Skincare Line of Innisfree. It is enriched with healthy ingredients such as Green Tea Extract, Mango Seed Butter, Cactus Extract, Orchid Extract, Camellia Extract, Orange Extract, Grapefruit Extract, Vergamot Extract and Tangerine Extract that gives the skin a radiant, soft and moisturized skin! It is free from harmful additives such as paraben, artificial color, mineral oil and animal derived ingredients. Apply an appropriate amount on your face first, then on the neck. The Whitening Pore Cream from Innisfree is a great Korean skincare product that brightens up the ski.. 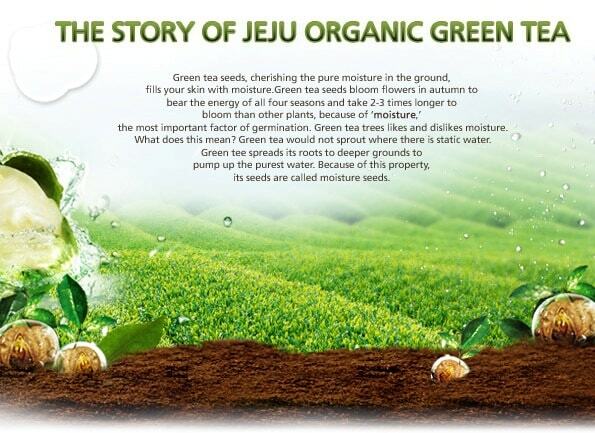 The Green Tea Fresh Essence is one of the popular Korean skincare product which is in the Green Tea.. The Green Tea Fresh Cream from Innisfree is one of the popular Korean skincare product from their G.. The Green Tea Balancing Cream from Innisfree is a natural Korean skincare product that contains Jeju.. The Innisfree Jeju Volcanic Pore Cleansing Foam, an effective cleansing foam from Innisfree. A famo.. Cleanse your face while retaining essential skin moisture with the Innisfree Green Tea Pure Cleansi..